We publish high quality local newspapers in the Sacramento Region (DMA). We publish local news sites to support each printed newspaper product, along with additional news sites for other communities in the region, including a daily news site with a national brand. We give our advertisers multiple options for reaching their target markets with in the Sacramento designated market area. We provide print, web presence and email news alerts. We offer banner advertising, online coupons, advertorials, business spotlight features, media press releases emailed to local readers, insert options into our printed newspapers and much more. Our approach is to help clients plan their advertising and marketing dollars in the wisest way possible. There are no real guarantees in the advertising world, but the better you plan the better chance there is of sustained success. We look at every advertising client as if we are building a long-term success strategy for their business. When our clients are successful, everyone is successful. Many of our advertising clients have been with us for many years. The Messenger Publishing Group is comprised of local newspapers and specialized websites serving a variety of readerships. The group is privately owned by Paul V. Scholl, Publisher of each of the products. He has been in the professional publishing business for almost thirty years. 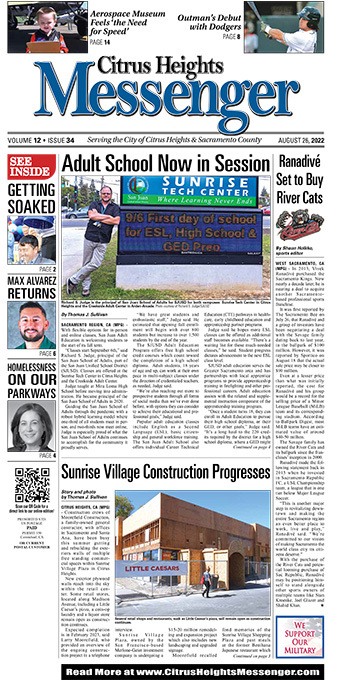 MPG began in 2006 with the publishing of the American River Messenger and has steadily grown to include many local newspapers found on the company web site. Your American Cancer Society fuels the power of hope as we meet head-on challenges of cancer each day. I wanted to thank you for your support as our Media Sponsor for the 2008 Daffodil Days campaign and for your assistance in promoting a wide variety of Relay For Life events throughout the Sacramento County. Events in Fair Oaks, Citrus Heights, Carmichael, Rancho Cordova, Orangevale and others have all benefited from your fabulous newspaper coverage! Daffodil Days & Relay for Life both provide unique opportunities to learn about our research, education and patient services that we provide. You have done an outstanding job of publicizing these services to each community multiple times. Especially the American River Messenger, and most recently, the Carmichael Times. With your help, we have generated millions of dollars that will be used to provide direct services to more than 8,300 patients in the greater Sacramento Area alone. Your many articles and ad’s have assisted greatly in raising awareness for our organization and our mission. Thank you so much for your continued support of the American Cancer Society and we look forward to working with you in the future! Thanks so much for the help with our publicity. It seems we had the best fund raiser/food fair ever and all the publicity is to credit for our success. We are glad to let people know that your paper was part of our success. Our fishing club is sincerely appreciative of your publication for printing our monthly press releases which has resulted in many responses from your readers. The Rooster Tails Fishing Club has added several new members as a direct result of reading your newspaper. You have helped us fulfill our goal to educate, entertain, and enhance the experience of fishing enthusiasts in your community via our regular third Friday breakfast meetings. Our club extends a Merry Christmas and the Very Best to you and Yours for a Wonderful New Year! I’m not going to lie. Your help last year with the Club Retro Teen Center and the Fireworks Supercenter made our fundraising MASSIVE! Your willingness to team with us was AWESOME – and I hope you are willing to do it again! “Many thanks for the nice coverage of our eye glass collection sites in Auburn for both club and 49er Lions. Our Lions club reached our 5,000 mark of eye glasses collected in the community in just 5 months! In fact, Auburn Hosts’ commitment to the Flying Doctors in sponsoring a village in Mexico enable us to send glasses to those who are in need. 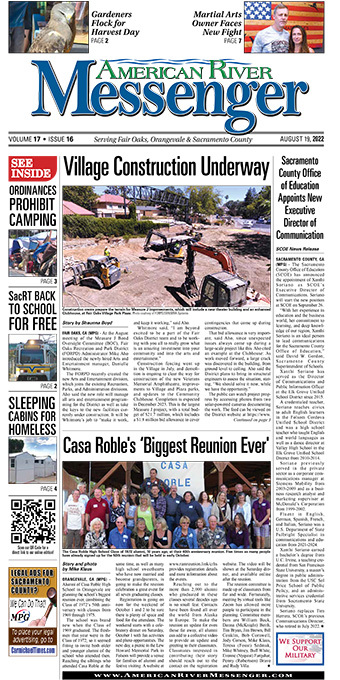 We’ll continue to keep the Placer Sentinel updated on activities of the local Lions events. Thanks again! First and most importantly, congratulations on receiving the Citizen of the Year award from the Carmichael Elks Lodge in recognition of all your support and dedication shown to our community. You are very deserving of such recognition. Secondly, I would like to once again thank you for the wonderful job you continue to do in getting our pageant information, community events and photographs of our City Ambassadors and queens in your papers. I know how much it means to them and I know that you know how much it means to me. So, a heartfelt thanks for your continued kindness and support you give me and my pageantry system! Thank you so much for your support to Colla Voce. It’s people like you that make our organization a true success. Our spring season went very well. We greatly appreciate you. You’re always so generous and loving towards our group and we’re indebted to you for that. Thank you for helping our group grow the audience, benefiting development of good taste in music of all generations of Placer County. Your rule! Thank you for the wonderful article on “Day with a Deputy” It looked great! We appreciate your help spreading the word about our free event. You helped make it a success! This was one of the most incredibly awesome stories I have read in a long time. It so touched my heart, I found myself crying like a baby. It took me back to my life and my parents, grandparents and uncles who served in the armed forces. I come from a generation of appreciation for life and respect for everyone. Lisa is such an honest, real person and to feel her through this story, made me realize I find myself drawn to older people for the need of knowing the world hasn’t really gone crazy. The story regarding Mike Williams really meant a lot to me and I wanted to thank you. Rough times come and go, and for me they are coming. People in this economy are low on money, low on jobs, and low on esteem. This story has inspired me and many others I’m sure, to go out and help those in need. Another reason this story is quite inspiring is that you can always look around when times are tough and think, there are others in the world that have it much worse than me. Thank you for including this story, it made my week. Wow, I love the “new” Sentinel. And all the info is what I want to know about. Praise for the info about “Poisons all around us” and “Seek and You Shall Find”. I felt like I was back in America again finding such an article in my newspaper. In fact the whole paper makes me feel like America has a voice again. Truth and facts, no spins, etc. Yes! To God be all the glory. Just a kind and quick word to thank you for a great and informative and interesting American River Messenger newspaper. I look forward to each issue. Really enjoyable to read. Thanks! Your rollout column is great. The GRM arrived in my mailbox and “almost” went immediately to the circular file. The “walnuts” article caused me to open and read the paper, one column leading to the next. Yours gets 5 stars, an A+ and a new reader fan. As past president of an HoA and casual observer of so many of the GR quirks over the last 21 years, I found my head nodding with your point of view and laughing more than a few times! Thanks for your contribution to the GRM. It won’t go to the recycle without an honest read.